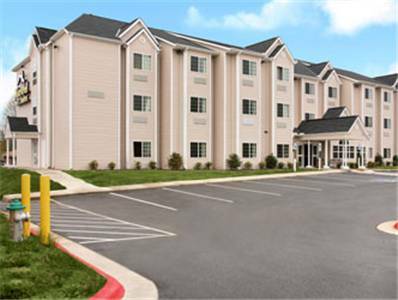 This Microtel Inn and Suites by Wyndham Rogers is convenient to boating and fishing on Beaver Lake, the Daisy Airgun Museum, the nature trails of Hobbs State Park, charming downtown Rogers, restaurants, and golf at the Prairie Creek Country Club. The University of Arkansas is 25 miles away in Fayetteville, and Bentonville is just 10 miles away. Begin your day with the complimentary continental breakfast, and check emails and news with the complimentary wireless Internet. A business center with fax and copy service, meeting rooms and public computer access help you take care of work details, and you can refresh your wardrobe with the guest laundry facilities. Spacious suites include wet bar, microwave, refrigerator and sleeper sofa. Non-smoking and accessible rooms are available.